It’s the first day of autumn! 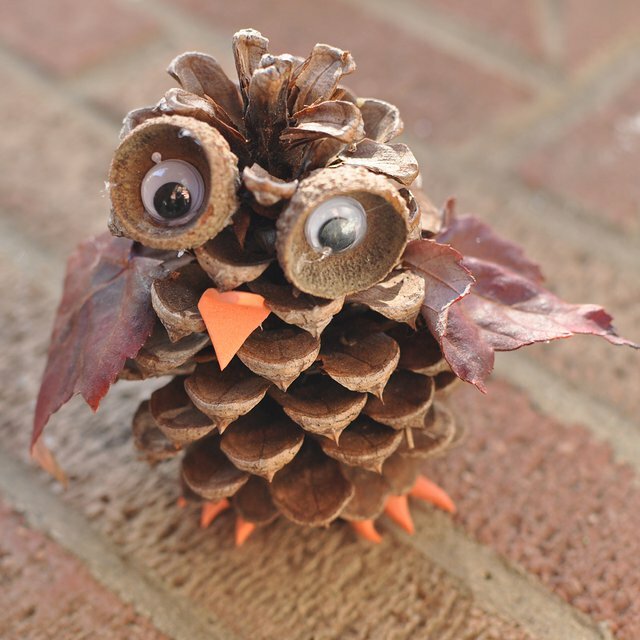 Celebrate the commencement of this new season by decorating your home with a few of these adorable pine cone owls! Spend time with your child as you take them outside to gather materials for this quick and fun craft! For a base, measure and cut a circle in a sheet of cardstock to fit the base of the pine cone. Cut a beak and feet from the orange craft foam. Glue the feet to the flat base of the pine cone. Glue the base of the pine cone to the cardstock circle, ensuring that the pine cone will stand upright once dry. For eyes, glue one googly eye into each acorn cup, then glue the cups near the top of the pine cone. In order for the eyes to sit into the pine cone, you may need to remove one or two of the pine cone spines. For wings, glue one leaf to each side of the pine cone. Glue the beak to the pine cone just below the center of the eyes. For more great craft ideas, visit Fairmont’s Arts & Crafts Pinterest board!